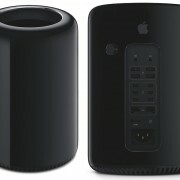 After last year’s non update update, the Mac Pro is getting some real attention. This year Apple has announced a very powerful, very small, and very strange new computer. Sure, it’s an “innovative” design. I don’t really even care that it looks like a trash can or a coffee maker. My editing computer is hidden away in a closet anyway. What’s important about this new computer is that it redefines the idea of expandability in a powerhouse computer. 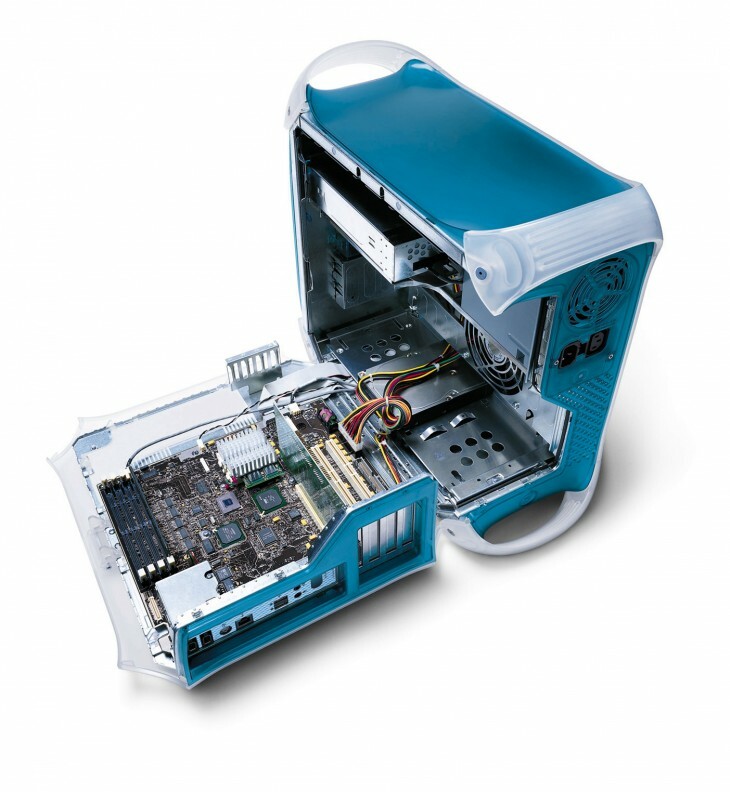 In 1999 the blue-and-white G3s introduced a tab that you could pull to swing the computer open and mess with its guts. Variations of this idea persisted in the G4, G5, and cheese grater Mac Pros. Just like on a generic PC, you could install hard drives, upgrade the RAM, and most importantly, install cards in its expansion slots. Since then there have been a number of other Mac models that offered limited expandability in exchange for “just working.” Those were and are some great computers. I’m writing this on a lovely 27″ iMac in an office full of iMacs and I like it very much. But sometimes you want your computer to do something that can’t be handled without direct access to the brain. Historically expansion cards have provided that power. The new Mac Pro has no slots for expansion cards and no space for SATA drives. What it does have is lots of Thunderbolt ports. Thunderbolt devices can theoretically handle most of the things that expansion cards always did, but here’s the problem: they don’t do it yet. 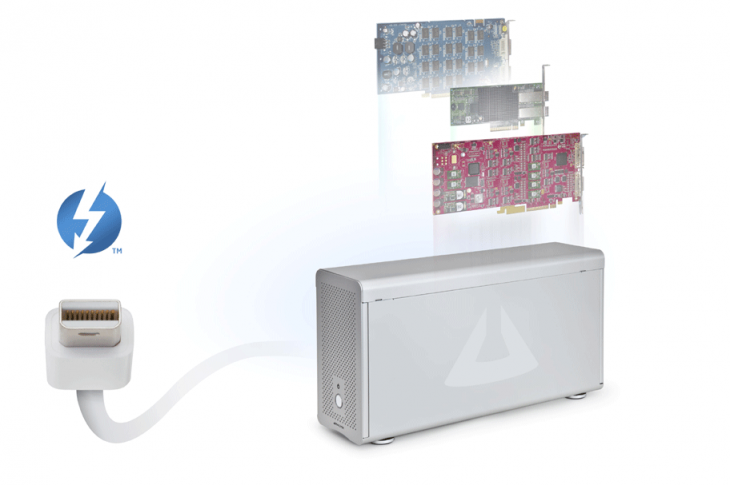 There are Thunderbolt to PCIe boxes that fill in the gaps in functionality, but they are very expensive. This new computer isn’t coming out for several months, so the world will be a different place by then, but Thunderbolt has been around for over two years and I rarely see Thunderbolt devices in the wild. The absence of Thunderbolt on the old Mac Pros has held the technology back from wide adoption in the professional realm, but the price premium is also a problem. G-RAIDs with Thunderbolt are almost twice as expensive as comparable Firewire/eSATA/USB drives. Glyph doesn’t seem to make any drives with Thunderbolt. The Thunderbolt version of the Blackmagic Intensity is $100 more than the PCIe card. The only complaint I ever had about the Mac Pros when they were current was that their thick metal cases made them much too heavy. That was usually a problem once per computer: when I took it out of the box and installed it and never moved it again. I certainly opened them up to install cards and hard drives and RAM, but I didn’t have to move them to do it. I and most people I know who use Mac Pros would have been very happy with an upgraded processor, Thunderbolt, USB 3.0, and I guess no Firewire since that seems to be the way things are going. If we’re lucky, this will be like getting rid of floppy drives. It seemed crazy at the time, but then everybody had a CD burner in their Macs and CD-R prices plummeted. Same thing happened with DVDs when Macs all had Superdrives. Now we don’t have any optical storage, and good riddance. Thunderbolt is a very complicated technology and the high prices are not arbitrary. Will removing the option to use anything but Thunderbolt make Thunderbolt devices inexpensive enough to use for everything? I hope so. I guess the big question is how much this machine will cost. An 8-core Xeon E5 is around $1500 depending on the speed. An AMD FirePro with 6GB of VRAM is $2400. There will be two FirePros in these things. Prices will go down by the time the computer is released, but his will not be a cheap computer. 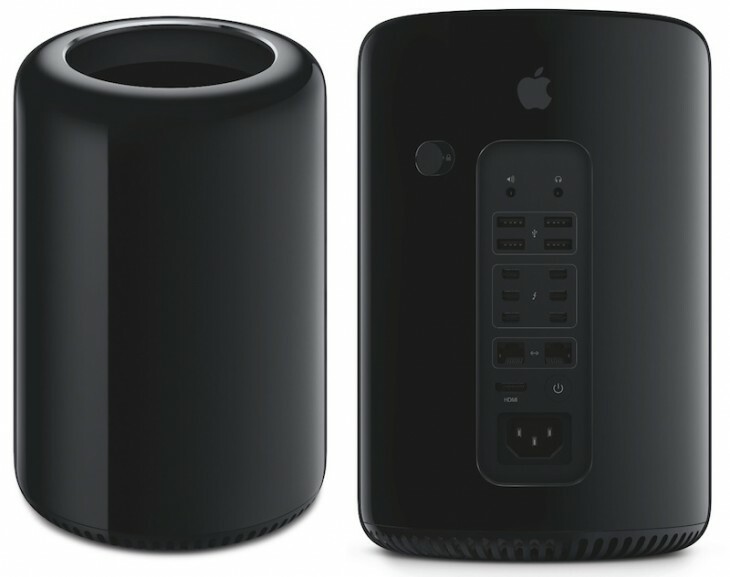 There was no mention of it on stage at the WWDC yesterday, but the Mac Pro has finally been updated after almost two years. There is a slight increase in the clock speeds available, and there doesn’t seem to be a dual quad-core option available anymore. The processors are still last-generation Bloomfield & Westmere-EP Xeons. Newer Sandy Bridge-EP processors were released in March, which as I understood it was the main reason Apple had to wait so long for an update, and why there should have been an update this week. The Sandy Bridge-EP processors start at 6 and go up to 8 cores! Other things that would have been reasonable to expect include updated graphics cards, USB 3.0, and Thunderbolt ports. Since FireWire is gone from the MacBook Pros, Thunderbolt & USB 3.0 are going to be available on a lot more drives in the near future and it would be great to have access to those ports on Mac Pros. 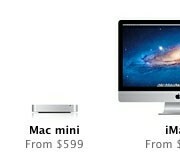 The Mac Pro is not exactly overpriced even with two-year-old technology. You would have a hard time putting together a computer with the same parts for much less money. But given the option, you would also be foolish to build that computer today. I happen to know that you can build a really great Sandy Bridge desktop computer for a lot less money because I did it last year with a Core i7-2600K-based system that cost me less than $1000 in parts. With the release of Ivy Bridge MacBooks you’ll soon be able to build your own Ivy Bridge desktops as well. I’ve been building hackintoshes since 2006, and it is much easier to set up now than it was in the early days. I’ve found that once the software is set up it’s as stable as any Mac Pro I’ve ever worked on and runs very fast. But hackintoshes are only for individuals and small businesses willing to live on the edge. I’m teaching FCP editing classes at The New School this year, and they have hundreds of Mac Pros running FCP. I would be laughed out of the room if I suggested they replace those aging hulks (they are very heavy) with custom-built PCs hacked to run software that actively fights being installed on the computer. The lawyers might have something to say about it as well. So what do you do as a creative professional who plays by the rules? You need power to run your fancy software. In my case I need flexibility. I need to monitor my video work on a video monitor. 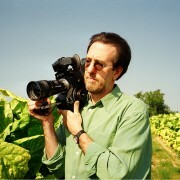 So I use a Blackmagic Intensity Pro PCIe card that costs less than $200 and does everything I need. I also have a nice computer monitor that I don’t want to replace every time I upgrade my computer. If you move up the chain a little, maybe you have a fibre channel network. Maybe you have an SDI video system that runs through your whole facility. You could use iMacs. If you’re really dedicated to Macs and you want to upgrade now, the iMacs have Sandy Bridge processor options and better graphics cards than the Mac Pros. There also seems to be a number of 3rd party options for expanding your iMac using Thunderbolt. Similar to external hard drives, you can plug a box into your iMac’s Thunderbolt port and then plug a couple PCI cards into the box. That box is $979 though. Not exactly a bargain. What I would recommend is looking at Windows. I know that makes a lot of people mad, but honestly as far as I’m concerned the only thing holding me back from Windows is all these HFS+ disks I have, and all the HFS+ disks I’ll work with in the future. I’m sure as hell not going to edit using MacDrive on Windows. I tried that once. After a couple years I’ll stop using FCP and both Avid & Premiere run great on Windows. FCP was the only reason I started using Mac OS in the first place. I like it. Snow Leopard is great. I also think Windows 7 is great. I’m not so sure about Windows 8 though. But I’m not so sure about Mountain Lion (or Lion). The rush to make the desktop more like mobile is not helping those of us who do fancy stuff on our computers. In my New School classes I’ve spent much of the first class explaining to the students that things are changing very quickly and that many of the technical things they learn in the class will be obsolete soon. My advice is don’t get too comfortable in your workflows. And don’t buy a new Mac Pro. Your old one probably works fine. Now Ross McElwee is on Kickstarter, and he needs your help! 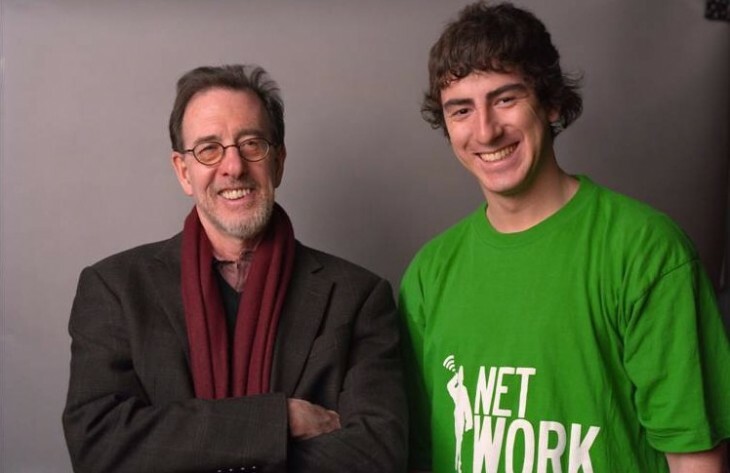 Although I somehow never had a chance to take one of his classes, Ross was a frequent presence around the basement of Sever Hall at Harvard. I first met him when he made an excellent cameo appearance in my film Camera Noise. Later I provided some sort of technical support while he was editing Bright Leaves, although I can’t remember what it was. But Ross makes movies, so he doesn’t go on Oprah, he goes on Kickstarter. He finished Photographic Memory last year and now he’s trying to release it. Support him! You can pledge to pre-order a DVD right now. We reached our goal 20 days ago, but that doesn’t mean you can’t still pre-order the DVD of Hal Hartley’s new film Meanwhile through Kickstarter. The campaign ends in 12 hours. 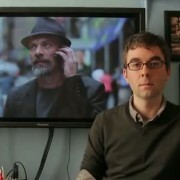 And for free you can see these two cool videos made by Aleks Gezentsvey and featuring me! And this one’s about the music in Meanwhile. My good friend, marriage officiant, alleged Indie Film Legend, and frequent employer Hal Hartley just started a Kickstarter campaign to raise money to finish his film Meanwhile. In addition to being a big fan of Hal’s movies, I edited Meanwhile, and I am very excited to see it get a chance to go out in the world. It started its life as a short feature, and kept getting shorter as we pared it down to its essential elements. For a while we thought it was a TV pilot, but sadly the world is still not ready for a Hal Hartley TV show. There isn’t really space in the traditional distribution system for a movie like this, so Hal has decided to take it to the people. For only $25 you can pre-order the limited edition DVD of Meanwhile. It’s a great deal. You get to support a truly unique and independent filmmaker and at the same time you get to take home a copy of a terrific movie. It also will help support me, since I edited the movie for free, and I only get paid if the movie makes any money. The first version was really crude because I couldn’t figure out how to hook in to the WordPress Media Library, but it worked well enough for my purposes. I always wanted to go back in and make it more user-friendly, so for the past few weeks I’ve been revising the plugin to tap in to the built-in uploading and media management systems. Big thanks to Andy Blackwell for posting his great tutorial on the very important attachment_fields_to_edit hook. I learned a lot more about the WordPress plugin system, and finally put the plugin in their directory, which forced me to learn a few things about SVN, which is a clever if initially baffling system. 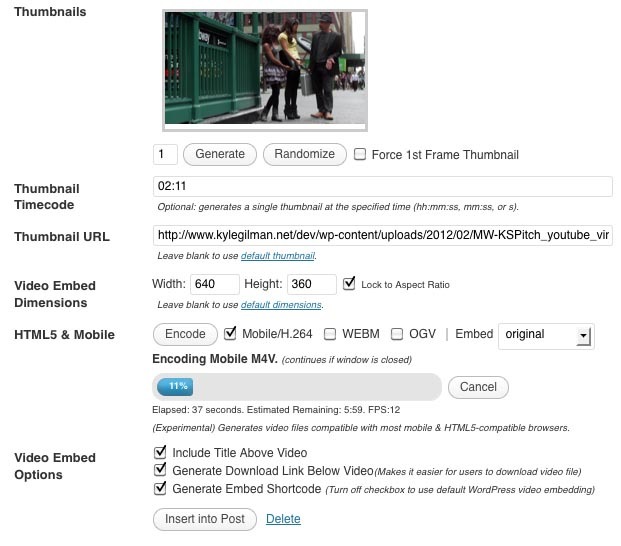 Anyway, I highly recommend the new version of this plugin if you’re doing any video embedding on your WordPress site. You don’t need FFMPEG if you just want a good system for posting videos you have hosted on your site, but if you do have FFMPEG on your server, you’ll get thumbnail generating and automatic HTML5/iPhone-compatible file encoding. It’s pretty neat.